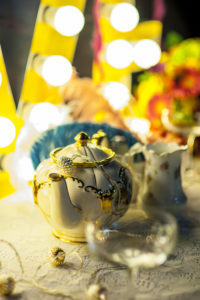 At My Pretty Tea Party we simply love all things vintage! Based in the village of Burwell just outside Cambridge, our beautiful and eclectic collection is inspired by a passion for seeking out the very prettiest vintage pieces and putting together a collection of china, cutlery and tableware to create stunning and memorable events. Our collection is currently available to hire for events from 2 to up to 300 guests and is continually growing, so if you have a larger guest list in mind, do please get in touch! Legend has it that a New York City tea importer named Thomas Sullivan became annoyed at the high cost of the tin boxes he used to send tea samples to customers. So in 1904 (or by some accounts, 1908) he switched to small cloth bags - now known as tea bags!